Have you ever wondered how it might feel to have a Buffalo Sabres' general manager scream at you in a bustling airport? Or how about having a heated nose-to-nose discussion with a Buffalo Bills coach moments before a debut television show - a program that almost didn't happen? And there were was the memorable encounter - on April Fool's Day - of sitting alone with O.J. Simpson in his empty home on his final day in Western New York before he moved to San Francisco to join the 49ers. Covering the Buffalo sports scene for four decades certainly involves remembering the obvious stories. And veteran television sports journalist Ed Kilgore shines a spotlight on dozens of banner moments. Wide right. No goal. The demise of the Buffalo Braves. The Bisons' debut in a new downtown ballpark. But what makes Kilgore's first book so memorable are all the "stories behind the stories" that spring to life. "They're stories that even the most avid sports fans would never know about unless somebody shared them," says Kilgore. "It's time to share." That's exactly what he does in his riveting book, As I've Seen it: Wide Right, No Goal and Other Buffalo Sports Sagas. 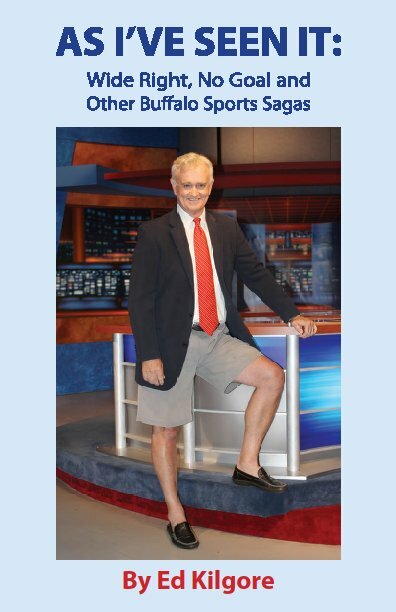 The sports anchor at WGRZ Television gives readers an open and honest behind-the-scenes peek into the highs and lows of covering the Buffalo sports scene for nearly 40 years. Clashes with high-profile players and management, history-making games and laugh-out-loud encounters make this book a must-read for local sports fans. The book is filled with dozens of photos of sports and media figures, images that vividly capture memorable moments. The final chapter tells an inspiring story about Kilgore's climb to the summit of Mt. Kilimanjaro. "This six-day climb, at the age of 63, made me literally want to shout from a mountain top that all of us are capable of doing more than we think we can," he said. "And the more difficult the task, the more enriching the payoff."